Purchasing Contracts is intended to be of assistance to those whose work is with contracts for the procurement of goods and services rather than yet another contract law textbook. This second edition contains additional chapters including one on the special rules governing purchasing by public bodies and utilities. The subjects of misrepresentation, exemption clauses and electronic contracting are amongst those that have been updated and covered in more detail. The bill currently going through Parliament on bribery is also dealt with. 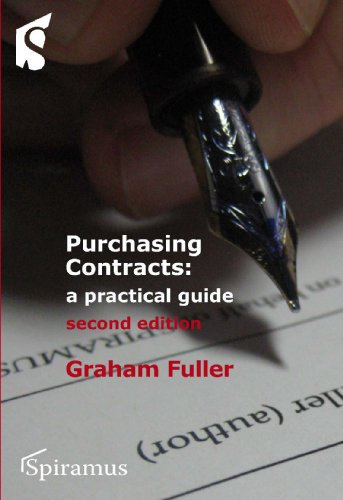 Graham Fuller is a visiting lecturer on procurement law and other subjects at the WMG an academic multi-disciplinary unit at the University of Warwick; and a regular presenter at conferences for the Institute of Purchasing and Supply. As a graduate in law he was called to the bar and practised for seven years until he became Senior Crown Counsel to the Hong Kong Government. He later became Senior Legal Adviser to Rolls-Royce plc, advising on matters including international joint ventures, technology transfers and purchase contracts. Graham Fuller's book would be a useful addition to any purchaser s library. It deals in a logical manner with all of the law a buyer is likely to encounter.